As much as we may like to think that it will never happen to us, the unfortunate fact of the matter is that theft is a real thing that happens to the best of people. And especially in such a closed in environment as a college campus, it can be a breeding ground for thieves. In fact, a public safety officer of Arizona State University described the campus “a Mall for Thieves”. In fact, campus crime is a major issue. The most comprehensive analysis by the FBI’s Uniform Crime Reporting recorded approximately 73,545 university and campus crimes in 2014. 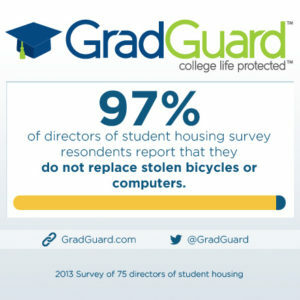 Living independently – on campus or off – brings new forms of risk to college life and it is important to recognize that you are responsible for your personal property as well as any damage you may create. 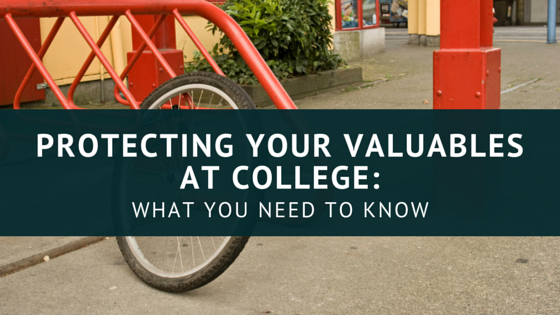 It is important to note that colleges report that they do not replace stolen student property. As a result, many schools recommend their campus residents purchase renters insurance from GradGuard. However, there are a few things you can do to ensure your peace of mind – and your stuff – stays intact. 5. Get Protected with Renters insurance. Renter’s insurance for students is really a smart idea. Not all plans are the same. Many renters plans available through the internet have a high deductible. Starting at $500 it doesn’t cover the smaller claims and provide much value to students. In addition, other plans require good credit or a credit check to secure coverage. Affordable deductibles starting at $100. Be sure to protect yourself both with both renters insurance and with good habits.